Alexander Hamilton served as the first Secretary of the Treasury. 2. What Is a Long-Term Maturity Treasury Note? The federal government requires a steady flow of money to operate, and if it spends more money than it takes in, the government is placed in a position where it has to borrow money to make up the difference. 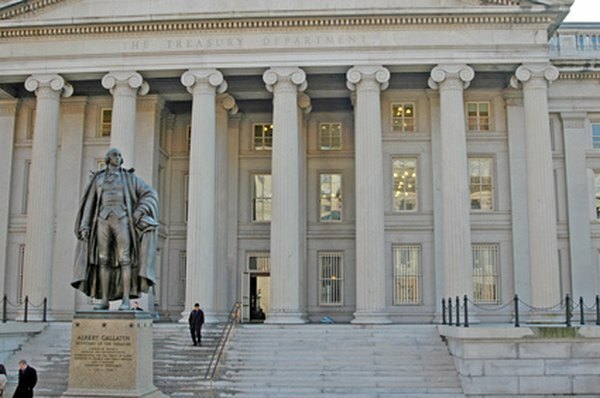 The United States Department of the Treasury borrows money from individuals, institutional and government investors by selling U.S. government securities, such as Treasury Bonds, Treasury Bills and Treasury Notes (also called T-Notes.) There are a number of advantages to owning T-Notes, including safety, liquidity and with certain tax benefits. You can elect to have up to 50 percent of the interest earned on T-Notes withheld if you buy them online through a TreasuryDirect account. This may reduce the amount of your overall tax payable. Treasury notes, along with bills and bonds, are fixed-income investments. They provide investors with a payment on a set schedule. T-Notes are issued for terms of two, three, five, seven and 10 years, making them an intermediate-range debt investment. The Treasury Department sells T-Notes with a fixed interest rate at an auction. Bidders are free to pay more than the face value of the note to get the benefit of the fixed rate during times when demand for T-Notes is high. When demand is lower, investors can buy T-Notes for less than their face value. One of the main advantages of choosing T-Notes is that they are considered one of the safest investments, according to the Securities Industry and the Financial Markets Association. Since they are backed by the full faith and credit of the United States government and are considered to be the safest of all investments, T-Notes are not rated by any credit rating agency, such as Standard and Poor's or Moody's, because they are considered to have no risk of default. Unlike some other types of investments which fluctuate in value over time and with changes in market conditions, Treasury Notes pay out at a set interest rate until their maturity date. Since the interest rate stays constant, you will be able to plan how much you can expect to get back over the term. You have the option of holding your Treasury Notes until they mature, or you can sell them in the secondary market if you decide you want to convert them to cash at any point. The market for T-Notes and other U.S. government securities is one of the largest and most liquid bond markets in the world. You can sell your T-Notes in the secondary market through your bank, investments broker or dealer. T-Notes pay regular interest every six months. The interest paid on your T-Notes is fully taxable on your federal income tax return in the year you receive it, but it is exempt from all state and local income taxes. You have more than one option if you’re interested in adding Treasury Notes to your investment holdings. Buy from the U.S. Treasury: Visit the TreasuryDirect website and open an account. (There is no charge.) Once your account is open, you choose the type of security youwant to buy (in this instance, a Treasury Note) and the amount. You also agree to accept the yield that is determined at the auction. Make a Purchase through your Bank, a Dealer or Broker: If you decide to buy Treasury Notes through one of these sources, you can specify the yield you will accept (competitive) or agree to acceptthe yield as determined at auction (non-competitive). For more information about Treasury Notes and how they can fit into your overall investment plan, contact an experienced financial adviser. Can a Treasury Bond Mutual Fund Go Bankrupt?